I preached what will be my last sermon on my placement at the wonderful St Aidan’s in Leeds today. Here is the text below. God’s story is our story. We have been blessed with the Bible, God’s story of his interaction with his beloved creation. The stories we read in the gospels are our story. In Holy Week I tried to help us to step into God’s story as we looked at the stories of some of the lesser characters in Mark’s gospel. Now we have come to the Easter season and we walk in the most astonishing and delightful part of the story of God’s dealings with his people. So let us again seek to step into this story. What might Jesus have to say to us? The disciples in our gospel reading today are hiding. They are hiding from fear of the Jews. Are they hiding from God like Adam and Eve did in the Garden of Eden? Perhaps they are, in a way. What was the last thing they did before the arrest of Jesus? They fled and denied knowing Christ, even though each of them had said they would be willing to die for Jesus. They are still not willing to die for Jesus. They are hiding and they are terrified. They know Jesus is dead. They know that his body has gone from the tomb but they have no understanding as to what this might mean. I think they believe what Mary first tells them, that the body has been taken away and they don’t know where they have put him. Mary has since told them that she has seen the Lord but this just makes no sense to them. It is into this context that the Risen Christ appears to the disciples. What is the first thing Jesus says to the disciples? Does he say ‘Where were you?’ or ‘You abandoned me?’ No. He says, astonishingly, ‘peace be with you’. Then John gives us what I think must be one of the greatest understatements in scripture, he writes: ‘then they were glad when they saw the Lord’. Of course there is the absolute delight in seeing Jesus risen from the dead but I think the rejoicing happens partly because in saying ‘peace be with you’ Jesus is saying ‘I forgive you, you thought you were no longer my friends but you are still my friends and I say peace be with you’. He says ‘peace be with you’ again. Then he does something else astonishing, he says ‘I send you’. This is a group of frightened men hiding in a locked room who don’t even understand what has happened to Jesus. In that state, he tells them that he is sending them. There is no sense that they need to pass some kind of test first before they get sent out: they’re ready now. Jesus says ‘as the father has sent me so I send you’. It almost sounds like ‘get up, take up your mat and walk’. Then we get another hint from Genesis, Jesus does something really weird. He breathes on them. Has anyone breathed on you before? If they have I’m sure you don’t remember it as a pleasant experience. How does God bring Adam to life when he is created from clay? He breathes on him. Only the Creator God can give life to something that is dead. In a sense, the disciples in that locked room are dead and lifeless, they are dead in their denial of Jesus, their sins, in the way they have let God down. Jesus breathes on them and says ‘receive the Holy Spirit’. Unfortunately in English it is hard to make the connection but in both Greek and Hebrew the word for God’s spirit can also mean breath or wind. The Hebrew word for spirit is ‘ruach’ – it even sounds like a breath as you say it. So Jesus, the one who until very recently was dead, breathes life, the Holy Spirit back into the weak disciples. As Paul writes in the letter to the Ephesians ‘even though we were dead because of our sins, he gave us life when he raised Christ from the dead’ (Eph 2:5). In receiving this forgiving power of the Holy Spirit the disciples are then to do the same, to forgive others in that power. Jesus knows exactly what we need. He knew what the disciples needed to hear and see and touch. In this first appearance in the locked room he shows the disciples his hands and his side, to show them he is not a ghost but real and can be touched. Thomas isn’t there and so he is afraid that the disciples have just been seeing things, that they’ve had some kind of hallucination. He makes the perfectly reasonable statement that he wants to touch Jesus in the very spot where the nails went in. He has to be sure it’s the same Jesus: that he’s not a ghost and neither is he just a man that looks like Jesus. These are the same questions I have. Surely they were just seeing things, the mind when going through grief can do strange things. Surely it was just wishful thinking? Or maybe a man did come into the room but it was just some bloke that looked rather a lot like Jesus? It can’t actually be that man we lived with for 3 years and saw brutally killed. Jesus, when he appears to them all again it is again in a closed room (interestingly not locked, but still closed, there is still some doubt there) and again, the first thing he says to them is ‘peace be with you’. In doing this he is saying ‘I meant it you know, I really do forgive you, you really are still my friends, peace be with you’. Then he immediately knows what Thomas needs and offers him the chance to touch the place where the nails were in his hands and feel where the lance pierced his side. Jesus is happy to show him how real he is. 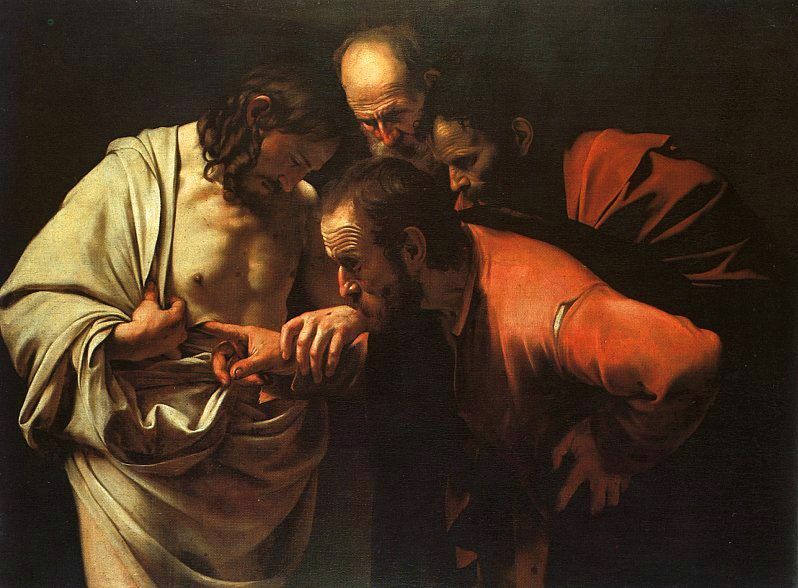 This is enough for Thomas, we don’t even know if he takes Jesus up on the offer to put his finger in his wounds, he simply makes the first full profession of faith in the divinity of Christ in the Gospel and says ‘my Lord and my God’. Jesus knows what we need. He knows we need something tangible to let us know that God is real. Something we can touch. So he gave us Holy Communion. A reminder each week that Jesus is real. We can touch and taste and receive him in the bread and the wine. Just when you were worried that God felt like an imaginary friend, we are reminded, week by week that he is real. Do you feel you’ve let God down? Do you feel empty or inadequate? Have you been shutting God out of your life? Do you want to know that Jesus is real? Jesus says ‘blessed are those who have not seen and yet have come to believe’. Rev the sermons that you put in the site is very useful.God bless you and your ministry.